LOUDON, N.H. – After decades of dreaming and planning, those visions and designs became a reality on Thursday, as the North East Motor Sports Museum opened the doors to its first display car. And it was fitting that it was the No. 1 modified, driven to more than 50 victories by Geoff Bodine in 1978, that was the first car to roll onto the floor. The car was purchased from Bodine by race fan Carl Oberg (Sutton, Mass. ), who directed its restoration, which was done by Ronnie St. Germain and Mark Alden. It is as authentic as possible with great attention having been paid to incorporating as many of the original pieces on the car as could be found. Restoration took three years, following Oberg’s purchase of the car. The winter will be spent outfitting the near 10,000 square-foot museum building. There are nine custom-built display cases to be filled with trophies, helmets, photographs and racing memorabilia. A first class library is being set up and video is being edited for the museum’s theater. Dozens of cars and motorcycles will follow Oberg’s modified through the building’s garage door. The museum is heavily focused on New England motorsports and the artifacts to be placed will be for races and championships won in New England or elsewhere won by New England drivers. 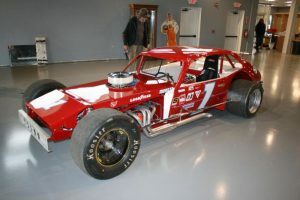 All kinds of New England motorsports will be seen in the museum, including racing motorcycles, cars that raced up mountains, on ice covered lakes, on asphalt and dirt oval tracks and road courses. The museum is a grass-roots project in which there was no huge financial backer or team of backers, unlike the way most new museums are funded. Racers and race fans contributed money and local contractor tradesmen contributed their time and materials to build the facility. The combined value of donated cash, services and materials exceeds $1.2 million. Over 800 people have contributed in some way to the project. The museum will open to the public in the spring of 2016. Maybe the most famous car to ever race in New England. That is quite a “get” for the museum. Those folks are doing it right.